A Young Professional Spotlight by Nia Tarmell. The road leading to where he stands today was by no means easy. 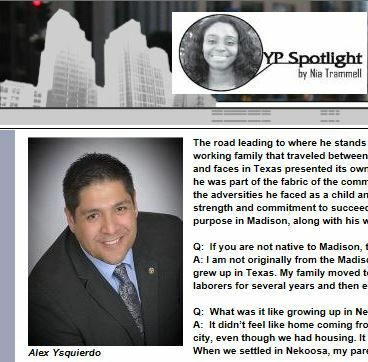 Alex Ysquierdo grew up in a migrant working family that traveled between Texas and Wisconsin. Spending time away from the familiar spaces and faces in Texas presented its own set of challenges. It was through sports that he soon began to feel like he was part of the fabric of the community in Nekoosa, Wisconsin, where he spent his time as a teen. Despite the adversities he faced as a child and eventually working his way through college, he clearly had the strength and commitment to succeed. The journey without doubt has more than prepared him to live a life of purpose in Madison, along with his wife, daughters and their dog.